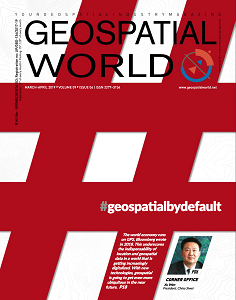 Geospatial World Magazine - On GIS, Remote Sensing, UAVs, LiDR, BIM..
Geospatial World monthly magazine (formerly known as GIS Development magazine) addresses current and relevant issues of the Global Geospatial domain. Each edition of the magazine brings for the latest news and happenings from the various part of the world, presents viewpoints of the experts, through interview and perspective articles, assimilate case studies and reviews on the recent and upcoming technologies, products and also advocate on various policy issues. Considered by the experts’ as one of the best publications in its field, the magazine enjoys a circulation of 15,000 copies to over 140 countries across the globe. The special focus of the magazine is in South Asia, Asia Pacific, Middle East, South America and African countries. The readership of Geospatial World magazine comprises of a complete cross section of the community. It is widely read by geographers, surveys and cartographers, academician, researchers and students and also by engineers, managers and developers.